Ryne Sandberg resigns and my encounter with Ruben Amaro earlier this week…..
Monday was the first game of the Gulf Coast League. Baseball Ross and I made the trek to Tampa to see the GCL Phillies take on the Yankees1 team. It was oppressively hot. As Ross and I sat on the bleachers, Phillies great, former World Series winning manager Dallas Green came and sat on the bottom row of bleachers. As the temperatures rose, I went looking for shade under the press box. As I stood there, Ruben and his daughter walked up the ramp to the platform so that his daughter could use the ladies room. Amaro smiled and said hello. When his daughter was done the they went down the ramp to go back to the bleachers and Amaro, walking with his head down as always nearly smacked into Ross, who was coming up to stand in the shade with me. Ross looked at him and they each stepped aside and went on their ways. Amaro went to sit on the bleachers…not with Dallas Green but with Ed Wade. 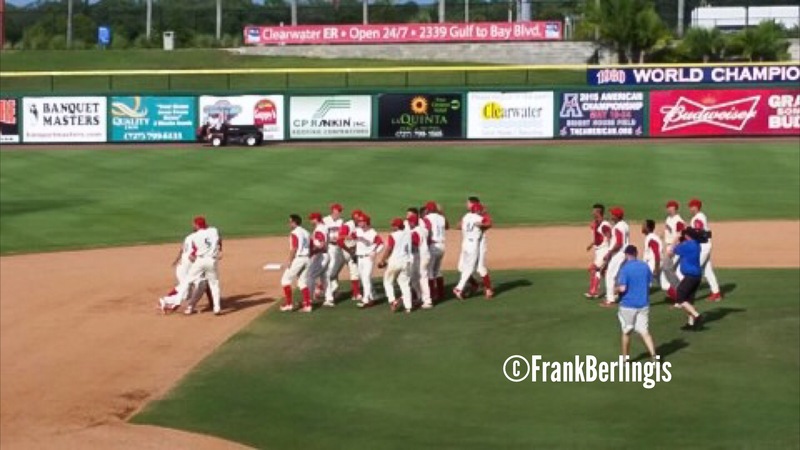 The Times They Are A Changin’-CLEARWATER THRESHERS WIN FSL NORTH AND BERTH IN PLAYOFFS! Last year it was tough to be a Clearwater Threshers fan. At this point last year, they had only won 17 games of the first 70 games! 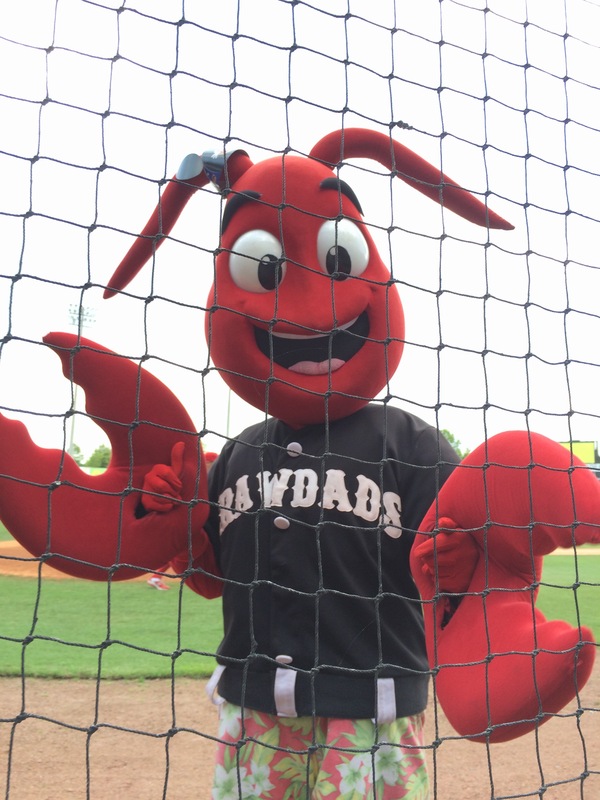 One of the absolute worst teams in all of Minor League baseball. This year, they are 37 and 33 and most importantly, they made the last five wins really count. It is important to note that the Florida State League divides its season into two halves and the winner of each half gets a playoff spot (per division). Going into the last five games of the first half, the Threshers were second in the northern division trailing the Daytona Tortugas by five games. Clearwater took the first step by winning two games against St Lucie before the three final games against Daytona. Daytona, by contrast, lost their last five games before starting the series with Clearwater. 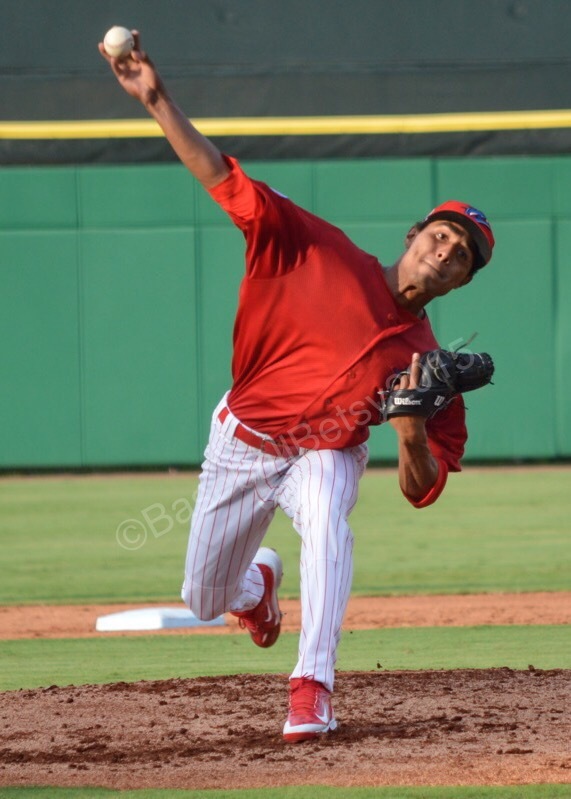 Monday night, newly promoted Ricardo Pinto made his Threshers debut. Pinto was outstanding in his debut leading the team to a 4-3 win. After that, the biggest factor was the weather. 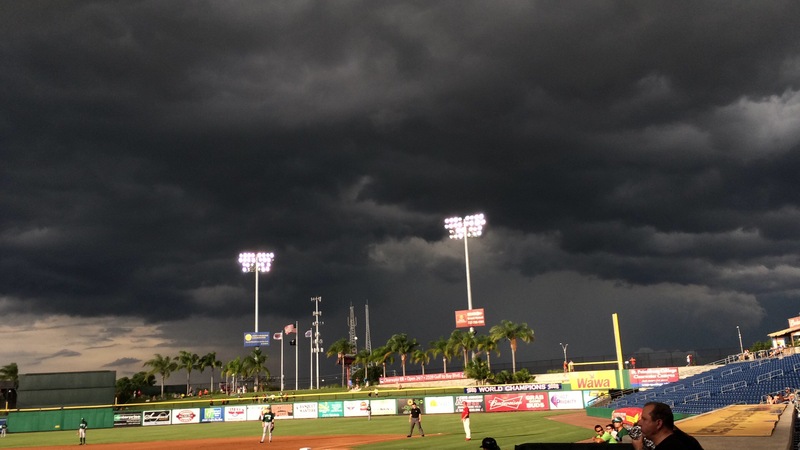 Tuesday night, the rain and lightning started in the second inning. The remaining 7 innings were to start today at noon with the second game to be only 7 innings. So just before noon today Ross and I entered Brighthouse as lightning crashed nearby. The rain was heavy and the lightning frequent and close. 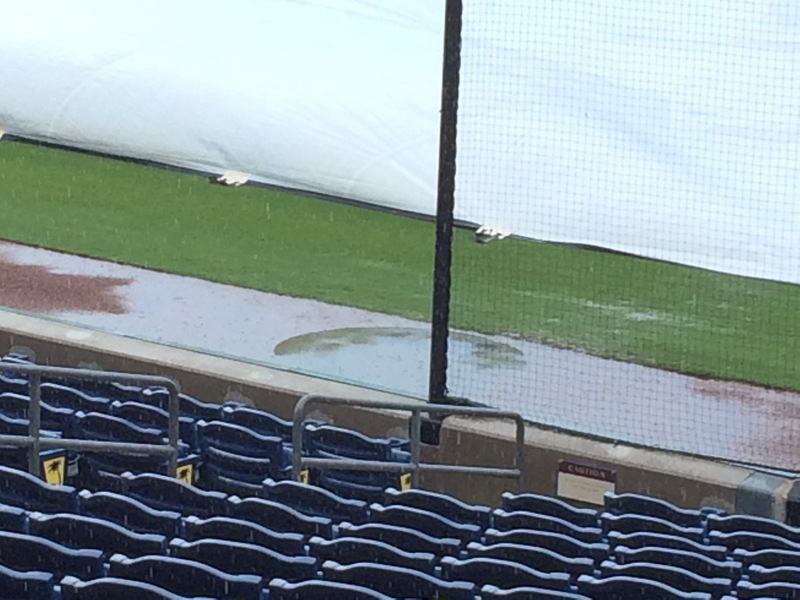 The on deck circle was under water. But 10 time best groundskeeper in FSL, Opie Cheek had the field in tip top shape after the hour and 40 minute delay. 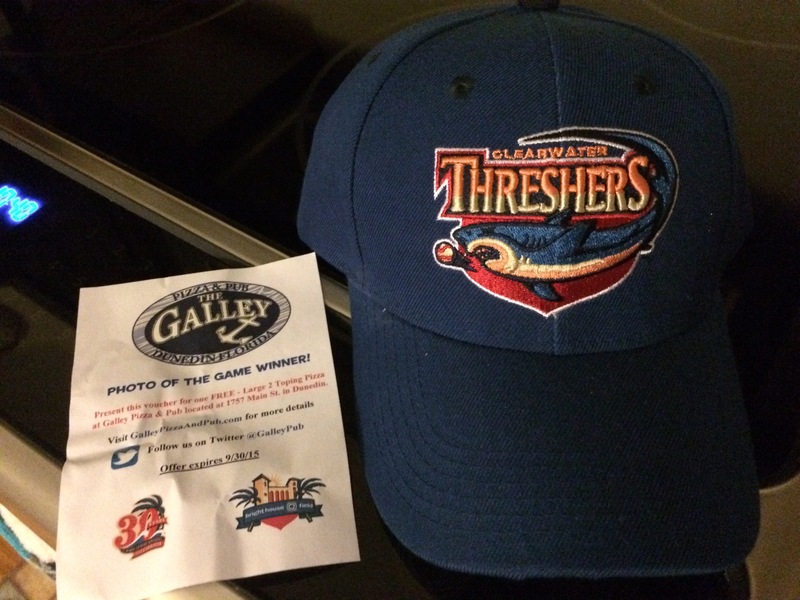 The Threshers won the game 6-4 and it looked like we might be able to breathe. FSL All Star and Member of Team Canada, Colin Kleven took the mound for game two. Kleven shelled the Tortugas, striking out a total of eight, six of which he struck out in a row during his 5.2 innings. Kleven’s ERA is now down to 2.89. Kleven’s final line was 5.2 IP, 2H, 1R, 1ER, 3BB, 8SO and 1 HR. 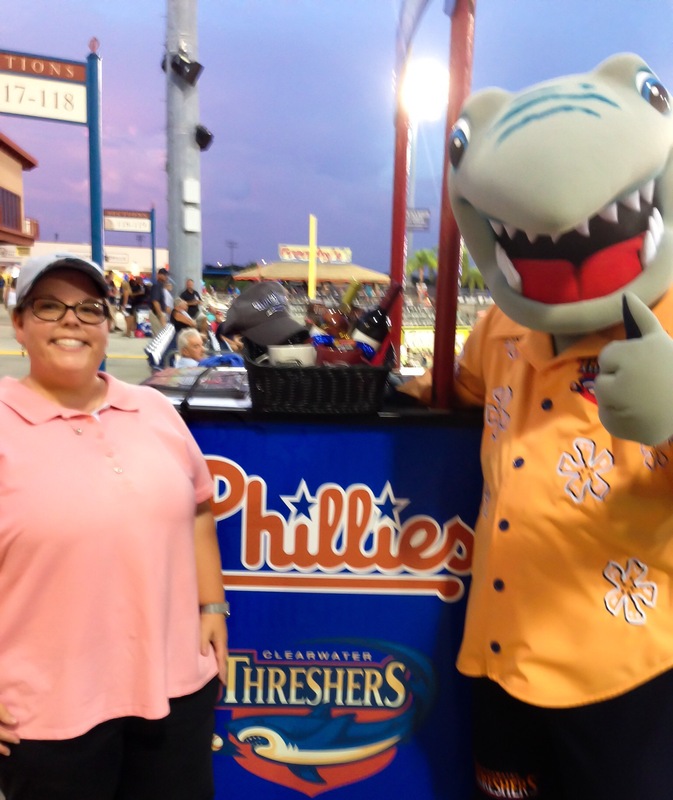 Threshers were up 3-1. Ulises Jaoquin gave up a home run to the first batter he faced making the score 3-2 Threshers. I held my breath. It was close. So many times last year, we would get our hopes up only to have them dashed. Would it happen again? Jaoquin settled in and they won! 3-2! For the first time since 2007, the Threshers are going to the playoffs! I screamed so loud that I was afraid that my neighbors would call the police thinking I had been murdered. My dogs were frightened, but I was elated! 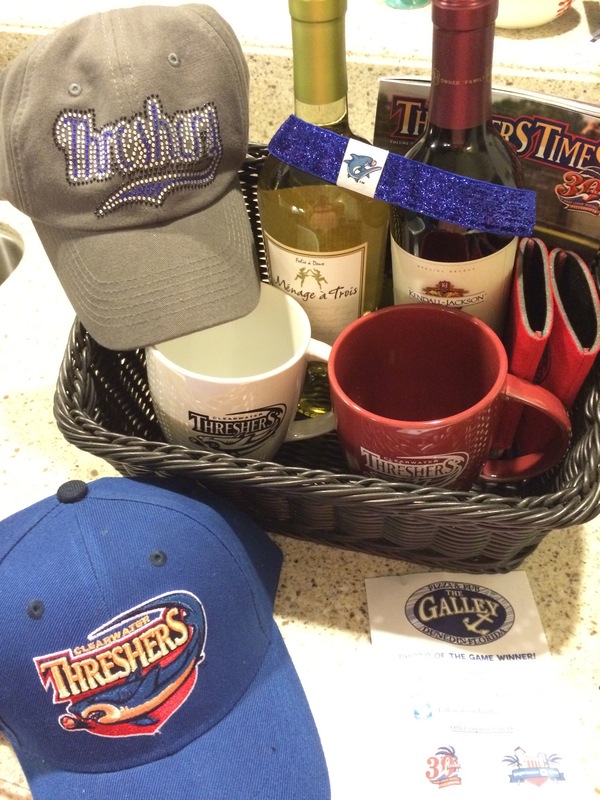 THE THRESHERS ARE GOING TO THE PLAYOFFS! This was one of those amazing nights that I won’t soon forget. Not just for the game but a lot of things. 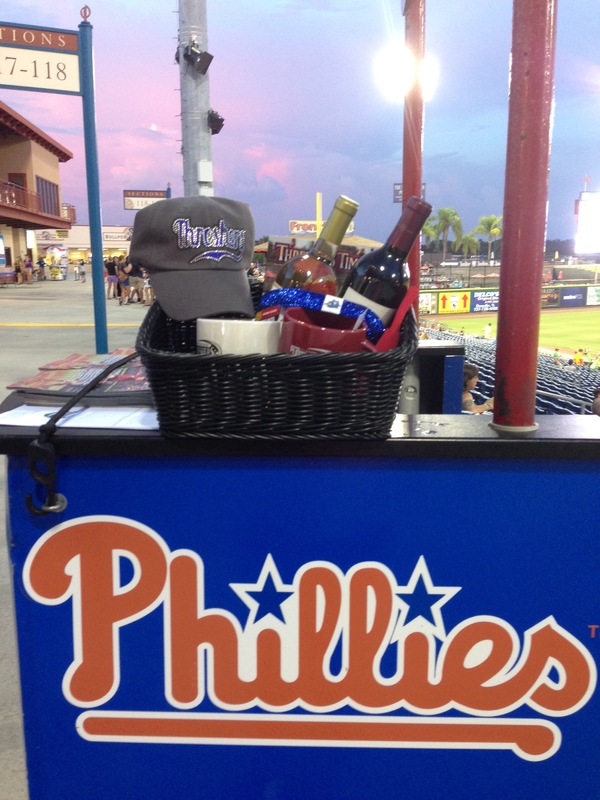 Baseball Ross and I went to the Threshers game tonight and it was Ladies’ Night where they give away a gift basket. On a whim, I signed in and we got something to drink and took our seats. It was hot, really hot. We were not getting any air and the game was moving very slowly. By the top of the 4th, the Threshers were down 7-0 to St. Lucie and Ross and I were drenched with sweat. We thought we’d wait to see if I won the gift basket before we left. Then Ross suggested we take one with the field in the background…and with the distraction of taking pictures we failed to notice that the Threshers has loaded the bases so as Ross took the picture…they were scoring on Andrew Pullin’s GRAND SLAM! The game was tied at 7! The basket was awesome! There were two bottles of wine, two huge coffee mugs, a hat (sparkly too), a headband, tickets to a concert and two coozies! We took the basket to the car we realized we needed to walk our dogs…so we ran home and took care of the pups. My mother was one of those “always send a thank-you card” kind of people. 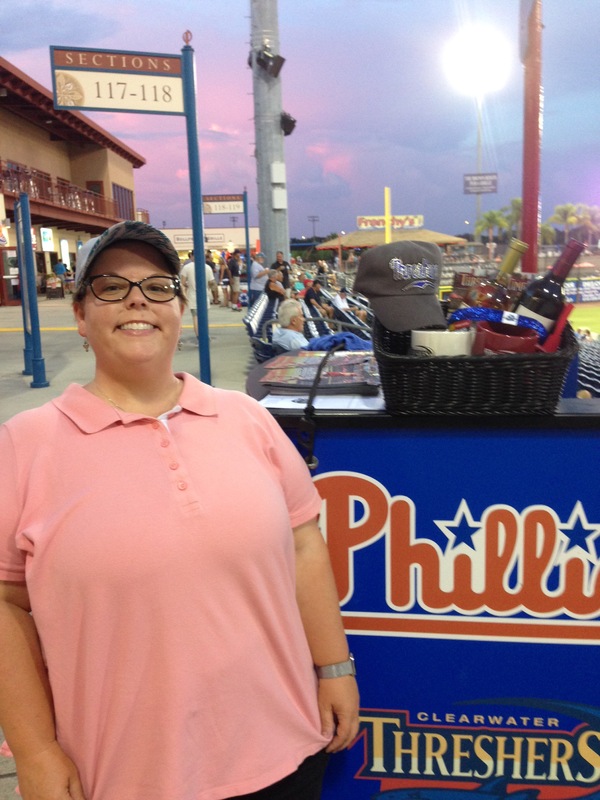 So I sent the Threshers a modern day version, a tweet of the picture of me with Phinley with my note of thanks—AND IT WON PHOTO OF THE NIGHT! I must be good luck, because just as I claimed my second prize of the night, Aaron Brown hit a walk off single to score Dylan Cozens in the bottom of the ninth! They literally won at the same time! 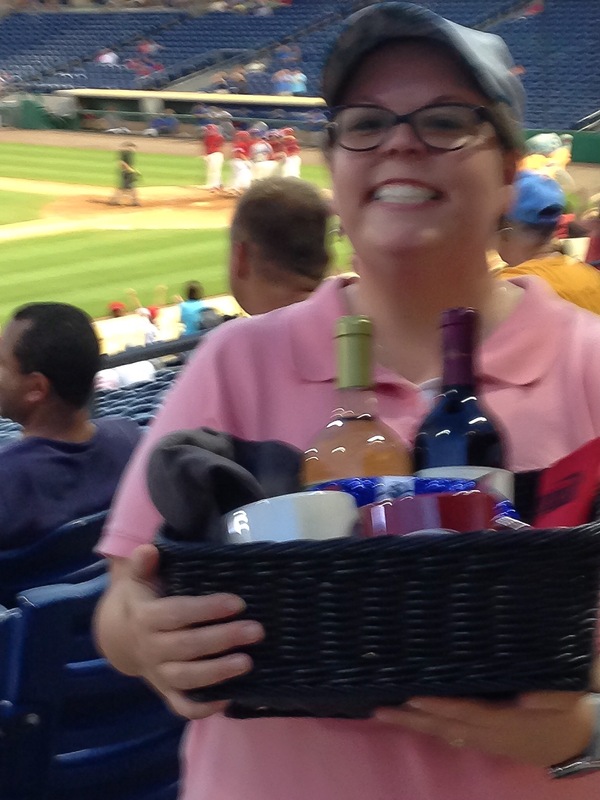 I win the basket- they get a grand slam, I win photo of the night and they walk off winners too…coincidence? 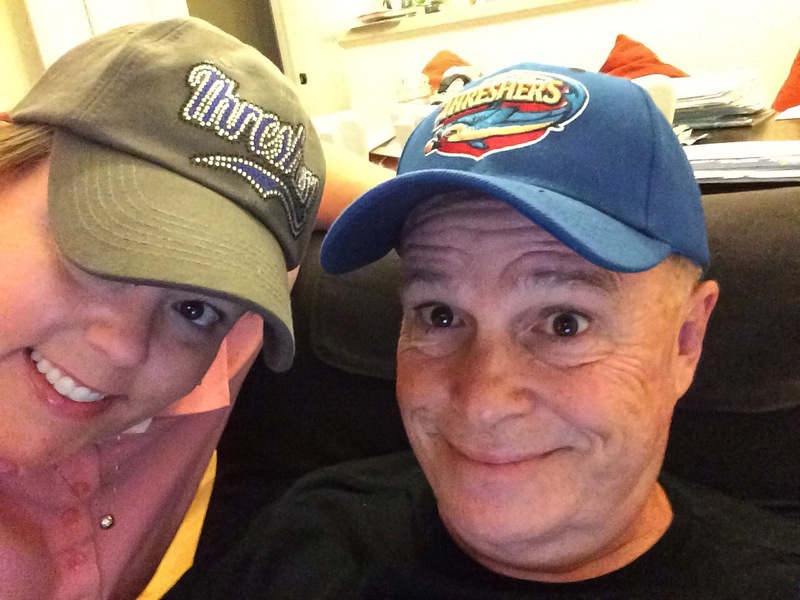 I gave the 2nd hat to Ross and we will get pizza for Fathers’ Day on Sunday-what a great night we had! I don’t think I’ve ever been so lucky! What an amazing time! A woman attending last night’s Red Sox, A’s game was seriously injured receiving what was described as “life-threatening injuries” when Brett Lawrie’s broken bat flew into the stands. Injuries cause by equipment flying into the stands is something that I’ve not only seen while attending sports events, baseball and hockey but sadly, something I experienced first hand during the 1997 AHL play off season in Hershey, Pennsylvania. I had just started dating Ross and we were really into watching the Hershey Bears, a perennial contender for the Calder Cup. The game started with a fight, a big fight that caused on of the Kentucky Thoroblades to be ejected only five minutes in. The goon, Ken Belanger, went into the locker room, got dressed and was walking the concourse. Of course, that caught the crowd’s attention, so I will be the first to admit I should’ve been watching the game. However, I wasn’t and I would pay dearly for not paying attention. Hershey Bear Captain Mike McHugh hit a wraparound shot on the glass that picked up speed as it went. Ross and I were sitting where the glass went from high to low so as the puck whipped around the glass, it came to the end of the high glass and went out in the crowd full speed. I knew from the sound of the puck that it was coming our way so I turned to look-so I know which way duck but there wasn’t time. The puck hit me squarely between the eyes. I was lucky, I never lost consciousness. My first thought was to check to see if Ross was it as well. Before I could turn my head-my vision was obscured by blood. By the end of the night I went home with 15 stitches, a concussion and a skull fracture. To this day, I have a scar between my eyebrows. The emergency room doctor said I was lucky, had the puck hit me anywhere else in the head I might not have had a good outcome. Just five years later, 13 year old Brittanie Cecil was killed at a Columbus Bluejacket game in the same manner. Soon after, the NHL placed nets behind the goal for safety. Had the nets been in place at the time of my incident, I wouldn’t have been scarred. Is this incident the one like Brittanie Cecil’s, the one that will make MLB act in the interest of fan safety? While getting a foul ball is baseball tradition, is it worth the risk? What will it take? MLB didn’t take action in 1970 when a 14 year old was killed by a line drive ball hit by Manny Mota at a Dodgers game. Fan protection must be paramount and MLB must act. At last report the injured Sox fan had undergone surgery and was in stable condition.